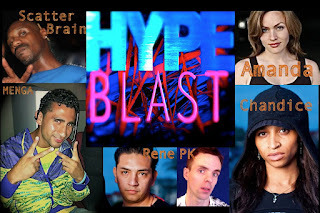 Hype Blast, is electronic dance music band/project, formed in 2009 by Menga (Rapper, MC, Songwriting) and Peter Kirkpatrick (Production, Composition, Songwriting) featuring various talents of Amanda Martindale, Chandice Anastasia, Virus, Son, Scatterbrain, Showtime, Rene, and OZ, with techno and trance influences, and recorded at Pete O’Carroll Records. "TONIGHT" is euro club tune about 130 B.P.M. "EVER SINCE I MET YOU" song about 105 B.P.M. "RUN AWAY" -- 140 B.P.M. "TOYS ‘R US KID (Hype Blast Remix)" -- 142.5 B.P.M. "TELL ME" -- 120 B.P.M. "ALIENS HAVE LANDED" -- 140 B.P.M.